In a post yesterday, I explored seven insights from Dr. Howard Glicksman’s 81-part series, The Designed Body. Glicksman takes us on a remarkable exploration of the ways that the human body works to stay alive in a world that’s essentially trying to kill it. To survive, the human body must control 40 chemical and physiological factors. Failure with any one of these results in death. Though Glicksman uses medical rather than engineering terminology, the human body is an engineering marvel — an amalgam of interlocking chemical and engineering solutions, sort of like chainmail armor — with dozens of diverse, interdependent control systems driving hundreds of functional subsystems, composed of tens of thousands of specialized parts, and comprised of ~37 trillion individual cells. Each cell is itself an engineering marvel, comprised of thousands of interdependent parts, precisely arranged and coordinating their actions. To make this work, the human body generates around 200 specialized cell types and well over ten thousand specialized proteins. All this “unfolds” from a single cell at fertilization, in a precisely choreographed process. Finely tuned control systems to manage each of the 40 chemical and physiological factors. Functional coherence across multiple levels of systems and subsystems. Process coherence across systems, and throughout an individual’s lifecycle. Interdependencies among systems and processes. Failure prevention systems to detect and defend against threats, correct errors, and keep everything working. Coherence is a distinctive property in which each piece-part is necessary for function, but none by itself is sufficient. Only when all the parts operate as a coherent whole does the body survive. Coherence is difficult to achieve and maintain under any circumstances. But survival of the human body takes functional coherence at a scope and scale that we can scarcely fathom — so far beyond our experience as human engineers that we have no comparable systems to compare it to. At the same time, coherence makes change more difficult. In a coherent system, a major change in one component (or subsystem) usually requires corresponding changes in other components (or subsystems). The more interdependencies, the more work is required to change a component, yet retain overall function of the whole. As any systems architect can attest, once a complex, coherent, interdependent system is built, it takes no small effort to adapt it in significant ways (e.g., to meet new functional requirements). Are other organisms similarly fine-tuned? Is similar coherence present in other body plans? Given that survival depends on controlling so many factors, it seems likely that every body plan must have its own version of coherence. Though the types of control systems and their tuning parameters may vary, we’d expect all such controls to be similarly fine-tuned. Asked the other way, are there any body plans, currently active or anywhere in the fossil record, that do not exhibit finely tuned coherence? I’ve not heard much discussion of this subject, suggesting that either the question is not being asked, or the answers are not defensible. If all 40 factors must be controlled at all times, else the organism dies, how can a complex control system like any of those presented by Glicksman come into existence? How do you control a chemical or physiological factor while the body waits for evolution to generate a complete control system capable of controlling that factor? For example, how do you supply oxygen to every cell in a large, complex body without every part of each required body subsystem (e.g., for oxygen exchange, carbon dioxide removal, circulation, iron harvesting, hemoglobin manufacture, and many more). Sure, we might theorize a simpler system to perform these functions, but it’s hard to imagine a partial system that still gets the job done. Regardless of how simple the simplest possible version of a control system might be, it still requires all the basic functionality of a control system, and these are, by definition, irreducibly complex. In the human body, and most (all?) other complex body plans, the control systems are also interdependent, so having just one of them, or even all but one, isn’t enough. How many generations are required for random causes to generate the dozens or thousands of parts needed for even one control system, with the correct control logic and just the right fine-tuning? No one knows, but it’s a lot — certainly more than could fit into the age of the universe. How many generations are available in the absence of all the needed control systems? Exactly zero, since no individuals will survive long enough to reproduce, and any gradual steps toward a functional whole disappear from the population. Humans have an elegant solution to the body plan assembly problem — one we’re quite familiar with. At the moment of fertilization, the human body consists of a single cell. As it grows into thousands and then to hundreds of millions of cells, it must bootstrap the control systems for all 40 survival factors. Each of the systems and subsystems (and their component parts, and the specialized cell types, etc.) must be generated, assembled, and activated, in the right places, in the right order, at the right times. It takes about 9 months for that single cell (aka, zygote) to grow into a coherent, independent whole (aka, tax deduction). As it’s developing its internal controls, this new life is extremely vulnerable to the forces of nature, so must rely on outside help to survive. With humans this occurs in the mother’s womb. In this extraordinary process, the mother and unborn child coordinate their activities, such that the mother’s systems “cover for” the growing child’s inability to control all the necessary survival factors. Only when all of its internal control systems are assembled and functioning can the child survive on its own. At the right time, through coordinated signaling (! ), birthing occurs and the child’s body switches over to its internal systems to perform their survival chores (e.g., respiration). It’s important to note that this process involves two different individuals, using completely different yet perfectly integrated mechanisms. Not only does this illustrate the survival challenges facing a complex body while it’s generating its systems, it also highlights the extraordinary engineering required to overcome those challenges — precise, interdependent, finely-tuned, coordinated functional and process coherence, in this case between two different individuals at two very different points in their life cycles. Just because this is common does not mean it’s ordinary. Aside from the wonder of what’s happening in the process, it’s uncommonly nifty engineering. How could any gradual process generate coherent, finely tuned systems, when a failure in any part of those systems prevents an individual organism from surviving? This is problematic no matter how much time is available. As an example, suppose I want to build a car that’s capable of getting me from point A to point B. It minimally takes several dozen parts to make a drivable car. I’m allowed to add only two or three parts at a time (gradual changes), but at each step, I can only keep what I’ve got if it meets the minimum functional requirement of getting me from here to there (survival requires a minimally functioning whole). Based on these rules (which parallel the survival constraints of living systems), it doesn’t matter how I begin, where I begin, or in what order I add parts — if I start with a tire and add only a couple of parts, I will never get to minimal functionality, even if they’re the right parts and I add them in the right places! When gradualism faces a complex assembly task, it inevitably fails unless (a) only a couple of parts are required, or (b) there are a number of intermediate stages, each of which is capable of minimal function, and each of which can be reached from a previous viable stage by only a couple of changes. Complex control systems fail on both counts, and thus present an insurmountable hurdle to gradualism. And this is true regardless of whether the process is directed or undirected! Knowing what, where, and how to bolt the parts together doesn’t get the whole built (when it must be done in discrete, gradual steps). Bolting random stuff together in random configurations is astoundingly unlikely to produce any useful function, much less ones that will enable survival at each discreet step. Random, undirected changes simply make the impossible even less possible. This is the basic flaw in the various genetic algorithms that purport to show how life can build itself randomly — minimal functionality is needed in every area at each step along the way, or the whole endeavor crashes. Coherent interdependence is an intriguing property — extremely difficult to achieve, and equally difficult to change. When coherent interdependence is essential to survival, as it seems to be for all living organisms, the systems view tells us to expect new body plans to appear suddenly, in a functionally complete form, and change rarely, generally in functionally minor ways. The fossil record aligns almost perfectly with this view. Nearly all body plans appear suddenly, with essentially no precursors, and are followed by long periods of stasis (invariance) — in many cases hundreds of millions of years — during which only minor variations occur. Hypothesize (and eventually find in the fossil record) a viable organism at each and every discrete step from a single-celled critter to a complex body plan like a human being (i.e., the theory must propose an adaptive continuum). Viability must account for all 40 of Glicksman’s survival factors at each step. Explain how any proposed causal mechanism(s) are sufficient to produce all the necessary changes for that discreet step within a single generation. Random causes, for example, cannot explain more than a couple of coherent changes at any given step, much less at every step. Efforts to date along these lines have been woefully lacking. Admittedly, this is an enormously hard problem, so perhaps we’re being too hard on the Darwinists. But science offers limited compassion for failed theories, especially when the supporting arguments consist mainly of vague story-telling about happy accidents in large quantities, using cool-sounding made-up words like de novo origination (new stuff that pops into existence out of nothing). Any gradualist theory that fails to address these most fundamental issues with more than an appeal to authority (we’re smarter than you), or an appeal to faith (trust us, we’ll find the answer), should be viewed with skepticism at best. Of course, doctors like Glicksman, who face the real-world implications of body subsystems that have stopped working, and engineers, who need to build systems that work in the real world, already know these things. Coherent, finely tuned, interdependent, systems of systems are essential to life. They’re needed at the outset, and at each step along the way. Even single-celled organisms cannot live without coherent, finely tuned internal subsystems. Coherence is thus a prerequisite for life — not the outcome of life, as Darwin supposed. This simple fact is profoundly problematic for material causation. Gradual changes simply cannot produce such systems. Neither can random causes. For Darwinists, the burden of proof grows, while the explanatory power of neo-Darwinism fizzles. Maybe it’s time to rethink everything. In the human body, Glicksman exposes a world of coherent complexity that we rarely think about, yet which demands a rational conversation. The questions raised are intriguing. Regardless of personal worldviews, any proposal that aligns with the preponderance of the data deserves less knee-jerk derision and more thoughtful consideration, both in the scientific community and in the public square. Glicksman’s series, The Designed Body, is worth a read. Think, understand, and be amazed. And also, maybe, be thankful to the designing engineer — the architect of life — who made the human body, and you, possible. 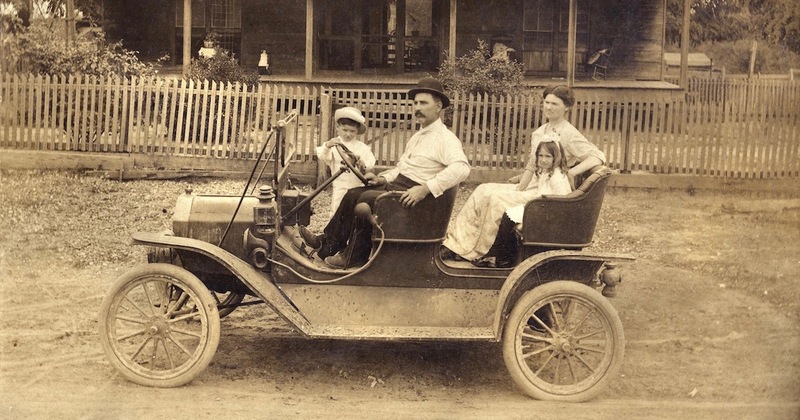 Photo source: William Creswell, Ford Model T Tourabout, c. 1910, via Flickr.